The story of Finnair and Finnish design share a closely linked history. We look back at ten highlights from the past five decades. Back in the 1940s, the Finnish writer and artist Tove Jansson created Moominvalley, a fictional haven populated by a gallery of irresistibly unusual characters. Today the timeless Moomins are loved around the world for their unique look and warmly philosophical outlook on life. In 1995 Finnair unveiled its new look as the Official Airline of the Moomins. Sniff, Snufkin, and Little My are among the characters featured in the livery and interiors of two Finnair Boeing MD-11 flying to Japan, where the Moomin brand currently matches Pokémon in brand recognition. When Finnair passengers enjoy a beverage in Business Class, they wrap their fingers around a superbly tactile piece of Finnish design history. Tapio Wirkkala’s classic Ultima Thule glassware was custom-designed for Finnair and debuted on the 1969 maiden flight to NYC, and to this day it remains the most popular line ever produced by design brand Iittala. Nearly 50 years later, Finnair still believes there’s no lovelier way enjoy to bubbly than from a frosty champagne glass by Wirkkala. The linen damask napkins, placemats, and tablecloths on the 1969 maiden NYC flight were designed by the world-renowned Dora Jung, pioneering Finnish textile artist and three-time winner of the Grand Prix at the Milan Triennial. Combining earthy tones with exquisite graphics, Jung created a linear pattern evoking the laminated surface of wooden aircraft propellers. 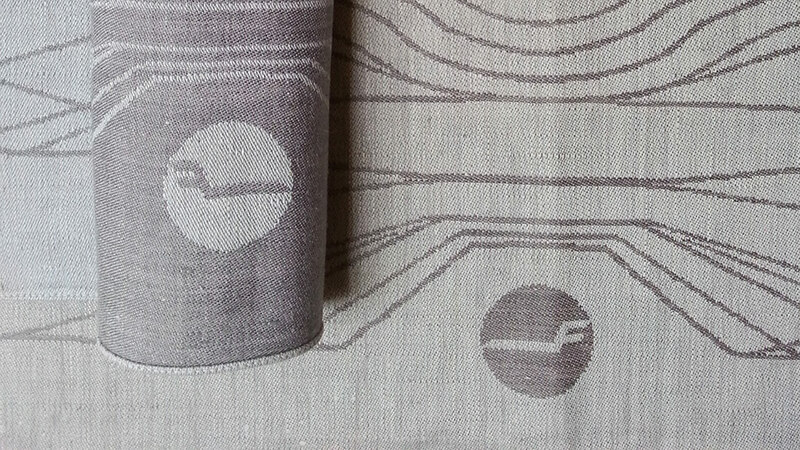 Today, Jung’s textiles for Finnair are sought-after vintage collectibles. Nordic hygge, or cosiness, finds fresh expression in Finnair’s cabin accessories. The Marimekko for Finnair Collection of textiles and tableware combines blue, green, and light grey tones with evergreen vintage patterns by Maija Isola to create a calm yet inspirational signature look for the cabin. The collection was designed for inflight use by Marimekko’s designer Sami Ruotsalainen, in original Marimekko patterns by Isola – a partnership that is unique in aviation history: no other airline has worked with a design house on a similar level of depth and detail. Designed by Maija Isola in 1964, the classic Unikko (Poppy) pattern is over a half-century old, yet retains a fresh, playful look that never fails to raise a smile. Originally designed as a textile, the pattern has adorned everything from tennis shoes to tea cups – not to mention Finnair’s planes. A blue version of the perky poppy brightened up the fuselage of an Airbus 340 from 2012 to 2017. Still flying today is an Airbus 330 sporting blue-and-green Unikko livery on intercontinental routes. In its 46th year, Finnair launched its maiden flight to the Big Apple in 1969, roughly two months before the US landed on the moon. Finland’s leading designers were enlisted to create a signature look for the cabin of the DC-8. The glassware, china, and cutlery were designed by the legendary Tapio Wirkkala. His streamlined cutlery was so ardently admired that it mysteriously began to vanish, and soon had to be replaced. Wirkkala’s Finnair chinaware is now a vintage rarity, featuring “F” emblems arranged like a flock of birds. A flight with Finnair wouldn’t be the same without sitting back to enjoy a moment’s escape with the glossy package peeking from the seat-back pocket. Founded in 1980, Blue Wings is one of the world’s oldest inflight magazines. Offering airborne reading with substance, it combines gorgeous photography, fresh layouts, and a cosmopolitan mix of stories accenting design, culture, and lifestyle. Continuing its legacy of championing Finnish design, Finnair offers a select range of classics through the Finnair Shop. And if ever there was an iconic Finnish designer, it is the famed architect Alvar Aalto. Timeless items by Aalto available through Finnair include the ever-youthful Artek 900 birch tea trolley from 1937 and the seductively undulating Savoy Vase from 1936. Both pieces have stood the test of time beautifully and wouldn’t look out of place in a contemporary design blog. The coveted Ball Chair is a cult icon of Pop aesthetics designed in 1963 by Eero Aarnio, who is still at the peak of his creative powers at the age of 84 – and still crazy about plastic. As hip today as it was back in the swinging 1960s, today, lucky passengers can curl up in the lap of this curvaceous beauty in Finnair’s Lounge in the Schengen area at Helsinki Airport. The soothing, airy interiors of Finnair’s new Airbus A350 XWB aircraft were created in cooperation with dSign Vertti Kivi & Co. The fresh Nordic look is brought to life by an innovative, dynamic LED lighting system that changes the colour and mood of the cabin to help passengers adjust to new time zones and seasons on long-haul journeys, switching from glowing orange in the East to fresh blues on arrival in Helsinki. The design received a prestigious International Yacht & Aviation Award for design excellence. This story is published in Under the Northern Skies – 100 Stories Celebrating Flying, Finnair’s jubilee publication celebrating Finland’s 100-year anniversary. P.S. : You can pre-order a copy from finnairshop.com before your next Finnair flight. It will be waiting in your seat when you board.